Slice-and-dice 10,600+ trading strategies. Select the statistics that interest you. 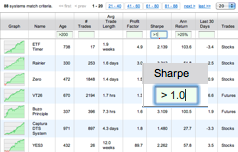 Want to see only strategies that have a Sharpe Ratio greater than 1.0? Just type >1.0. Just because we call it "AutoTrade" doesn't mean you don't keep complete control. Monitor all your positions, in real time, on the Collective2 site. Add your own stop losses and profit targets, increase or decrease position size, close out positions early. It's the best of both worlds: automation plus full control. 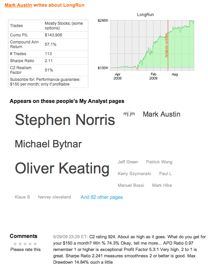 The new My Analyst page lets you write notes and commentary about trading strategies on Collective2... and read other people's notes. It's a great way to harness the collective wisdom of the site to find strategies to apply to your brokerage account. A lot of trading sites claim to help you make money. At Collective2, we want to show how our site can lose your money. Why talk about losing money? Because we love our Web site, dammit, and we want people to use it correctly. Collective2 is powerful investing tool -- perhaps too powerful. Like other powerful technologies, if used improperly, it can cause disaster. For those of you who haven't visited lately, let me summarize Collective2. 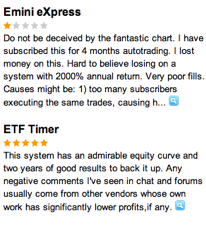 We track and audit over 10,600 trading strategies. Our AutoTrade technology is astounding: users can click on any strategy on our site, and have trades placed automatically in their brokerage account, without human involvement. It's this ease and power which makes Collective2 dangerous. When it's simple to sift through 10,600 trading strategies, and to start automated trading with a few mouse clicks, there is a temptation to just "try stuff" and see how it works. That's a bad idea. I founded Collective2 over six years ago. I've watched 36,000 people sign up for an account. I've seen a lot of people succeed, investing wisely and harnessing Collective2's power. But I've also seem a lot of people fail. Maybe I'm ghoulish, but the failures interest me most. They seem to be caused by the same, common mistakes. In order to prevent you from repeating them, I've compiled a list of the Top Three Mistakes People Make on Collective2. Mistake #1: Listening to nincompoops. Anyone can submit a trading strategy to Collective2. That's the beauty of the site. You'll find algorithms developed by physicists in Moscow, traders in New York, programmers in Mumbai. You'll be able to piggy-back on the genius of some of the world's brightest investors. But, you'll also find some of the world's biggest knuckleheads. How to tell the difference? There are clues. The nincompoops typically give themselves away. For example, Collective2 asks strategy developers to name their strategies. Sometimes, their choices are damning. Some choose names that make amazing performance claims. 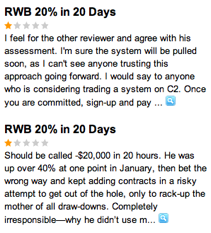 Of course these claims are silly -- no one can guarantee any financial performance, let alone stellar performance. This is the mark of an amateur. Here are a few actual examples of strategy names on Collective2. Would you trust your money to any of them? 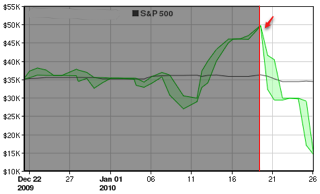 "1% per day" "The Holy Grail"
"30 pips per day" "Guaranteed To Make A Million"
Warning signs? Strategies named with explicit performance guarantees should raise a red flag. Mistake #3: Ignoring the stats. No one can predict the future, but sometimes there are statistical clues that warn you about oncoming disaster. Our job at Collective2 is to provide these clues. No one's perfect, and not all risk can be avoided. But it is surprising how often Collective2 will point out that a trading strategy engages in risky behavior, even before it blows up -- and yet people continue to be drawn to it, like moths to a flame. Here's an example. 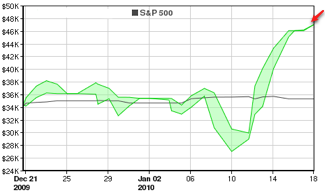 First, look at the performance chart of a system as of January 18, 2010. Looks pretty good, right? The Peak. Things looked good for this strategy in mid January. The clue. But this measurement of "Trade Risk" showed that problems lurked below the surface. Don't say we didn't warn you. Hope you didn't invest at the peak. What's the lesson here? It's impossible to avoid risk when investing. But if someone tells you that a trading strategy takes Extreme risks, think hard about investing your capital. If you understand the risks involved, and think they are worth the potential reward, then good for you, and Godspeed. Otherwise, search for a trading strategy that better meets your needs. We have over 10,600 of them. Surely we can help you find one that's right for you? Copyright (C) 2010 Collective2 LLC. All rights reserved. Unsubscribe from our monthly Collective2 newsletter.